In order to make myself clear I did a chart representing the exponential curve for the Error Tolerance Level (ETL). It helps to understand better what I tried to explain with my words. 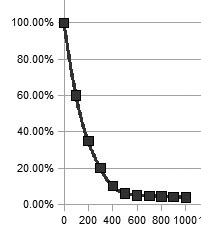 the ordinate Y) represents the EL in percent (from 0% to 100%). The more we repeat the movement and the smaller the EL. We strive for the perfect movement but we know that we will never reach it as perfection is of divine essence. Our goal is to reach an acceptable level of error that does not change the outcome of the fight, this is the ETL oe error tolerance level. It is like the time paradox of the arrow shot at the target and never reaching it in Zeno’s problem (cf. Plato, Aristotle, Zeno). To the mathematician mind we will never reach the perfect movement; but to the warrior mind it is good enough. Often in the dôjô and in life we want things to be so perfect that we don’t do them. The bujinkan is teaching us to act instead of thinking. Remember Watzlawick in “Munchausen pigtail” writing that action must precede reflection (thinking). This is a path of action we have taken by entering a bujinkan dôjô not an intellectual one. Don’t forget it (but don’t think too much about it). Next Post Blue Pill or Red Pill? you may also look at the six sigma methodology. It basically represents the amount of errors in a process (most of the time industrial) that is acceptable. Through process re-engineering you can dim defects by 3.4 in a million oportunities. The way Bujinkan was taught in the 1980’s compared to now, I think we can clearly see an improved teaching system, creating less “defects” per movement. Very interesting, sounds like music, just focus on playing your part of the movement! You must attune your instrument and keep it cleaned and tuned! Be aware of breath and posture! When to engage and when to break and enjoy all of the movements of the symphony! The Laws of Primacy comes into play; what you learn and how you learn the first time will stick with you for a long time and bad habits will be hard to remove and forget…. Learn the right movement the first time. Keep it simple and repeat until it becomes naturally part of you.